I read with special interest the article “Analysis of Strut-to-Bone Lengthening Ratio for Hexapod Frames Using Mathematical Modeling” by Alex Cherkashin, Mikhail Samchukov and Christopher A Iobst published in the January-June Issue (Vol. 3, Issue 1, pp 45-51). I have been quite impressed by the discordance (up to 5.8 mm) between measured frame lengthening and planned lengthening, and I think these results could have a large impact on clinical practice. However, the geometrical explanation of the Authors, which is based on Pythagorean Theorem does not persuade me. In [Figure 1], you can see the drawings of my geometrical demonstration of the reason the strut lenghtens less than the distance between rings. I think my clarification does not detract from the validity and originality of Author's concept, and in fact, the geometrical amount of strut lengthening is even less than that Authors calculated using the projective methods, in concordance with their results. Geometric demonstration is depicted in [Figure 1]. Line R1 represents the reference Ring, line R2a the position of the moving Ring before lengthening, line R2b the position of the moving ring after lengthening. OA is the initial distance between rings, OT the final distance, AT the absolute lengthening on frame and on bone. KA is the initial strut length, KA' is the original strut length on transferred on the lengthened strut, KT is the final strut length, A'T is the amount of lengthening of the strut. Because KA' has the same length of KA, the triangle KAA' is an isosceles triangle, and KA'A and KAA' angles are equal and <90°. 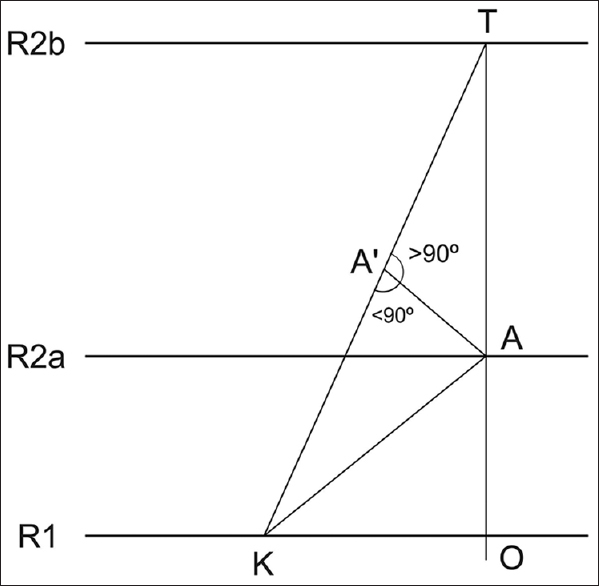 TA'A angle has to be more than 90°. Hence, the Cherkashin, Samchukov and Iobst geometrical model that draws this angle at 90° is incorrect because the triangle TA'A cannot be a rectangular one, but is a scalene triangle. TA side of the triangle (longitudinal lengthening) opposed to an angle more than 90°, has to be longer than TA' side of the triangle (strut lengthening). In other words, the point in which the two demonstrations differ is that Authors consider the lengthening of the strut (delta S) as the projection on the strut of the frame-bone absolute lengthening (delta B). However, because strut position changes during lengthening one has to consider that in the second position (after lengthening) the strut has a length that is the sum of his original length plus the amount of lengthening of the strut. As a consequence the two original strut lengths in the two different positions form the two sides of a an isosceles triangle and the amount of the strut length cannot be the projection of the frame-bone length, because this implies that the two angles opposed to the apex of an isosceles triangle have a value of 90 °. It follows that the Pythagorean Theorem is unsuitable for calculating the lengthening of the strut given the frame lengthening.